The ruling Movement of People for Progress (MPP) party said in a statement on Wednesday; Fresh violence took place close to the town of Arbinda in Burkina's Soum province at night of March 31, which had religious leader and six of his family members killed by unknown armed men. Many Lives Lost in Burkina as Sahel Violence continues. Numbers of civilians have been killed in clashes between communities in northern Burkina Faso last week, the ruling party said Wednesday, the latest in a bout of intercommunal violence afflicting West Africa's Sahel region. Burkina Faso, which had previously been known for its stability in a troubled region, has suffered 499 deaths from attacks on civilians between November 2018 and March 23 of this year. "On the morning of April 1st, reprisal acts were reported in the Arbinda Department. They were directed against a community following the assassination of a religious leader," said MPP spokesman Bindi Ouoba. "The provisional, non-official death toll is of around 20 dead." 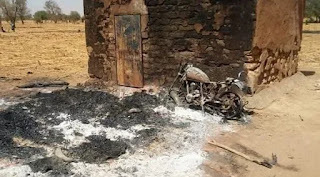 The MPP statement said a royal family was also attacked in the neighboring Boulgou province on the night of March 31, leaving at least nine dead. Burkinabe government spokesman Remis Fulgance Dandjinou said there would be no official declaration or death toll for the time being.